Here at California Home, we are always on the lookout for properties of pedigree. We’re talking about properties with provenance, the attachment of a famous architect or a rich narrative that moves them into the category of art. This magnificently renovated Beaux Arts mansion on the Presidio in San Francisco has an illustrious past that meets all of those distinctions. Forbes called it ”a mansion fit for royalty. 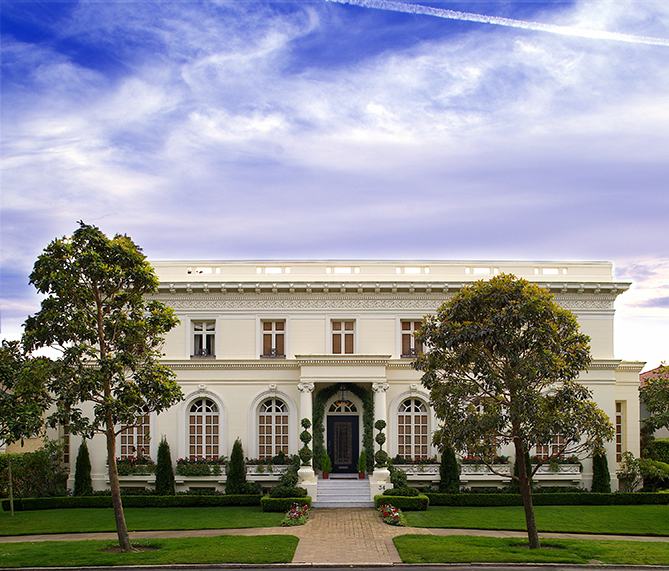 Or at least an elected official.” After all, former San Francisco Mayor Joe Alioto (1968-1976) once lived in this 1911 estate. Designed by renowned architect G. Applegarth, the 8,040 square-foot residence reflects a certain level of grace with a grand white marble reception hall and large public rooms for entertaining. From the formal dining and living rooms to the paneled library, the home takes you back to another era. A great room over lit by a large skylight with a retractable screen adjoins the modern gourmet kitchen, while a breakfast/sitting area opens to a beautiful side terrace and garden. Upstairs, there are four bedrooms suites that radiate from a dramatic u-shaped gallery, accessed by a double-wing staircase. The lower level features home theatre, playroom, gym with wet bar, steam shower with sauna, wine vault and an au pair suite. Other amenities include two laundry rooms, four fireplaces, updated systems and solar electricity.